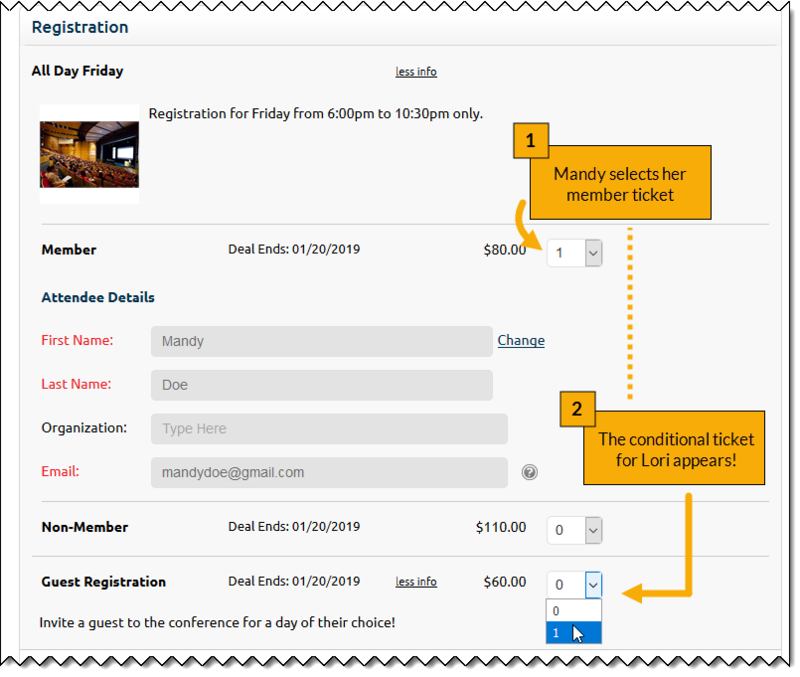 The power of conditional items allows you to increase the exclusivity of your event items to members only and offer an additional item after an initial item is selected. It’s incredibly easy to set up, so let’s dive right in! 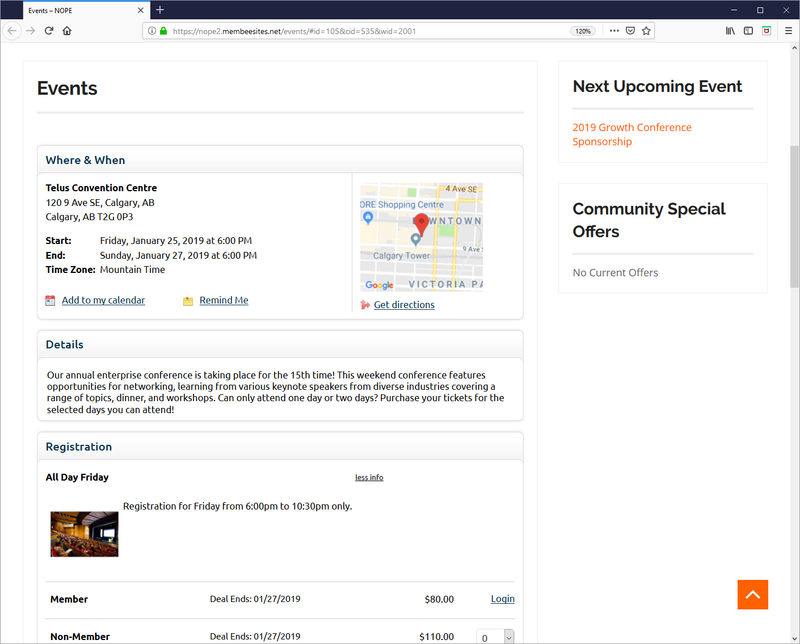 For example, Mandy Doe, a member of your organization, would like to purchase the “All Day Friday” ticket to your conference, priced at $80 for members and $110 for non-members. Mandy wants to invite her best friend, Lori, to convince her why it’s worth being a member of your organization. When Mandy goes to purchase her own ticket, she sees an additional event item appear called “Guest Registration” for $60. Instead of purchasing a non-member ticket for Lori at $110, Mandy can now purchase a guest ticket for $60! Conditional items are not originally listed in an event. They are only available for purchase when the item it’s conditional to is selected. When a member views your event page, they will see all the items listed except for the conditional item. Using our example, this is what Mandy would see when she comes to purchase her “All Day Friday” ticket – little does she know there is a conditional item in this event! Once Mandy selects her “All Day Friday – Member” item to purchase, a new item becomes available called “Guest Registration”. The Guest Registration ticket is the conditional item, which can only be purchased if an “All Day Friday” ticket is selected first. Below is a glimpse of what Mandy sees when she selects her ticket and Lori’s $60 ticket. Creating conditional items is a great marketing tool to showcase a specific item for a cheaper cost. When your members want to purchase an item, a conditional item can increase the value of purchasing the first item. The value of Mandy’s ticket increases when the Guest Registration item is available, especially at a lower price. Rather than having to pay $190 in total for her own ticket and Lori’s, she can purchase both for $140 – saving her $50! In Membee, a conditional item is created and works in the same way as a regular event item you create, but how does it become conditional? Well, it’s as easy as 3 clicks! When editing the settings for an event item, you can allow that item to be related to other items within the event or vice versa. Once this setting is activated, you can easily select which other items you want your conditional item to be exclusive to. In the preview below, “Guest Registration” is related to “All Day Friday,” “All Day Saturday,” and “All Day Sunday,” which explains why Mandy was able to see the “Guest Registration” item when she selected her Friday ticket! Have a different type of event? You can use conditional items whenever it fits your event, whatever your event may be! Even if you have a store, you can create conditional items for your store items. For example, if a member decides to purchase a t-shirt for $20, the conditional item could be a discounted lanyard for $3 – which will only appear when the t-shirt is selected.